Our Sample Succession Planning Process below provides a high level overview of what is required at each stage of the process along with some helpful tools to get you started. There is typically no shortage of leadership roles that would benefit from Succession Planning. However, it is critical to take a measured approach when introducing Succession Planning into an organization for the first time. With this in mind, the first step to identify those\ roles your organization should target based on urgency and criticality to the business. Now that you’ve narrowed down the need to your most critical positions, we can now focus on understanding the requirements of each role. At this stage, we define the talent composition required for success by incorporating present and future needs. This step will provide the requisite KSA’s to consider when selecting and developing future leaders. 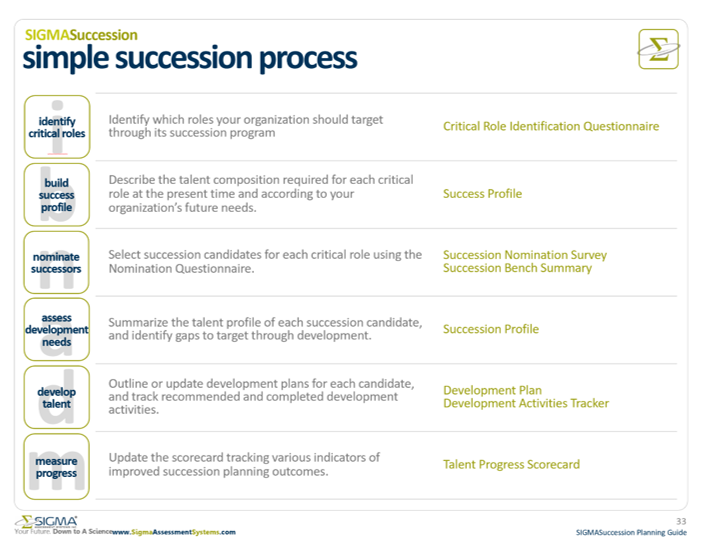 The Success Profile in the previous step is the lens we’ll use when selecting candidates for succession. The nomination stage adds much-needed credibility and transparency to combat perceptions of favoritism. Results from the nomination survey are used to populate a draft Succession Bench that groups successors based on their readiness and provides an ‘eye-test’ measure of bench strength for the incumbent’s role. A well maintained Succession Bench is also a great way to measure the Success of your Succession Plan. The nomination survey is only the first step in evaluating your bench strength. There is an incredible opportunity at this stage to add objectivity through scientifically validated leadership assessments. The assessments do not take the place of the candidate’s history and experience but add a unique perspective at an incredible level of depth. Any Succession Planning Process should incorporate an objective assessment to measure the talent profile of each succession candidate and identify gaps to target through development. To make your succession process truly effective, you now need to leverage assessment results to create a development plan that will help potential successors identify and close skill and experience gaps, and progress in their readiness to fill future roles. This is where the work comes in, as we manage development plans for each candidate, and track recommended and completed development activities. We recommend creating a development plan for, at a minimum, all your high-potential succession candidates. In a perfect world, you would have development plans in place for your entire Succession Bench. Tracking measurable progress indicators and regularly sharing the results with key stakeholders demonstrates the value of your succession plan and keeps its importance top of mind. During the initial stages of implementation, you may not like abut if you set and communicate reasonable expectations from the beginning, you’ll be able to show year-over-year progress. Get started today by looking at what you can easily measure now and gathering those numbers. Set a calendar reminder to review, compare and communicate progress every six months. Even if you only track one metric, get in the habit of recording it, attaching a dollar value if possible, and conveying that to your stakeholders. Succession Planning is a dynamic process – as organizational needs change, the Succession Process must evolve as well. It is important to consider how employee aspirations and talents can be aligned with the internal and external environment of the organization1. SIGMA’s Succession Planning Launch Series can help. The Succession Planning Launch Series offers a simple way for you to build a robust Succession Planning process to ensure your organization’s leadership is positioned for success and prepared for the unknown. To get started, complete our quick Succession Planning Checklist to measure the maturity level of your Succession Process and discover which areas within your Plan need to be improved.